We have cruised more than 60 times on a variety of cruise lines and while we do have favourites I nevertheless feel able to provide unbiassed reviews on any ship I cruise on. In my view Marella Discovery 2 is somewhat of a gem in the Marella fleet. Previously Royal Caribbean’s Legend of the Seas it transferred to then TUI, now Marella and first saw service under that brand in May 2017. We actually sailed in her in June that year on a thoroughly enjoyable week’s cruise around the Iberian peninsula. We enjoyed the cruise and the ship so much that we had no hesitation booking a two week Caribbean cruise ending on Christmas day 2018. Our decision to book was reinforced by the offer of direct flights from Glasgow to Jamaica along with the ‘bonded luggage’ arrangement meaning after our cases were checked in at the airport we didn’t see them again until they arrived in our cabin. Our cabin was the same junior suite we had on the June 2017 cruise. Yes it was a bit more expensive than a balcony cabin, but it offered so much more room, along with an extended balcony with enough room for a sunbed, a full height table and 2 chairs. There was extensive storage space, so much so that we didn’t use all the shelves and drawers provided. For those who like a bath there was a shower and bath in the bathroom along with very nice Clarins toiletries. Nice fluffy bathrobes were provided along with slippers and along with the usual electric kettle and supply of tea, coffee, etc., the junior suite also had a Lavazza coffee pod machine producing excellent coffee. Well worth the extra expense in my view. Meals on the Discovery 2 were very good, particularly in respect of food on offer in the self-service Islands restaurant. We had just returned a month earlier from a 28 night cruise on P&O Arcadia where the food on offer in the self-service restaurant was absolutely deplorable, comprising one relatively tasteless soup at lunchtime and five or so unappetising main courses. Most importantly the food on Arcadia was seldom hot. The food on offer in Islands was a complete contrast with two delicious soups on offer each day along with eight-ten main courses including a roast of the day. All the food was piping hot. Food in the main 47⁰ restaurant on deck four and in the Italian fare restaurant Gallery 47⁰ on deck five was also very good. The clear tomato bisque we had one evening in 47⁰ was one of the best soups I have ever tasted. We had no need to use any of the paid restaurants on the ship as the food in the free restaurants was so good. Even the food in the outdoor Snack Shack on deck nine is to be commended, where the freshly prepared battered fish fillets and chicken wings are simply out of this world. In terms of entertainment Marella is not one of those companies that bring in loads of guest artists. They rely instead on a show team comprising singers and dancers that deliver no less than eleven quite distinct and different shows in the ship’s Broadway Show Lounge. The entertainment is reinforced with two very good bands – Muzik Nation and the 4Tunes – along with a very talented pianist (Dino) and other individual musicians. The place to be for up close and personal entertainment is undoubtedly the Live Room where each evening there is a full itinerary of music on offer from the various bands and artists, culminating in a ‘band jam’ once a week where all the musicians get together to perform. The lead singers from the show group also have guest appearances in the Live Room performing their own cabaret sets. Despite being relatively ‘senior’ cruisers we spent many an evening well after midnight singing and clapping along to the music there. The only slight criticism of the Live Room is that it is too small to be the hub of late evening entertainment particularly after the main shows disgorge from the Broadway Show Lounge. On many an evening it was standing room only. If I was to make one suggestion to Marella about this it would be to think about using the much larger Venue on deck 5 where possible. 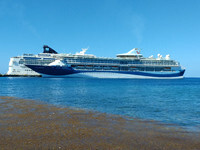 Marella Discovery 2 is of course an all inclusive ship and a very good all inclusive package it is too. I enjoy a Gin and Tonic or two before dinner and I was surprised to find that Tanqueray gin, normally only offered in premium packages, was being served by Marella in their standard package. What was even more surprising was the size of the spirit measures aboard the Discovery 2. Whereas on the P&O Arcadia spirit measures were a measly 25ml (5 x teaspoonfuls) on Discovery 2 measures of spirits served were 40ml. This compares to a standard pub measure of 30ml in most of the UK. Moreover, there was no difficulty obtaining a double measure, if like me you want to taste the spirit you are drinking. Unlike some ships we have been on there were always ample waiters around in show lounges and open decks to serve you. Some might be surprised to learn that Marella provides chilled drinking water dispensers on most floors and very good water it is too. A very nice 1 litre glass decanter is provided in your cabin so you can always have a supply of drinking water on hand and to fill your kettle or coffee machine. Dress code on the ship was generally relaxed or smart casual, but there were occasional ‘dress to impress’ evenings where some did make the effort to appear in their ‘finery’. On our recent Arcadia cruise a comedian made fun of Marella cruises, but based on my experience of both cruise lines I believe it is P&O that is becoming the laughing stock of the industry and Marella is firmly establishing itself in the middle ground of the cruising industry. A particular strength of Marella is its ability to offer cruise & stay/stay & cruise holidays where you can experience the best of what a cruise offers along with fabulous hotels in prime locations. I have no difficulty recommending the Marella Discovery 2 to any potential cruisers, be they first time cruisers or like myself experienced cruisers who want to try out the competition. To be absolutely clear Marella cruises does offer very serious competition. I will undoubtedly cruise on a Marella ship again and I am particularly looking forward to the 2020 season when the new Marella Explorer 2, previously the Celebrity Mercury, will be sailing from Newcastle. This will be a great attraction for those who like sailing from the UK and don’t have to worry about flying or taking an extra suitcase or two. We have cruised more than 60 times on a variety of cruise lines and while we do have favourites I nevertheless feel able to provide unbiassed reviews on any ship I cruise on. In my view Marella Discovery 2 is somewhat of a gem in the Marella fleet. Previously Royal Caribbean’s Legend of the Seas it transferred to then TUI, now Marella and first saw service under that brand in May 2017. We actually sailed in her in June that year on a thoroughly enjoyable week’s cruise around the Iberian peninsula. We enjoyed the cruise and the ship so much that we had no hesitation booking a two week Caribbean cruise ending on Christmas day 2018. Our decision to book was reinforced by the offer of direct flights from Glasgow to Jamaica along with the ‘bonded luggage’ arrangement meaning after our cases were checked in at the airport we didn’t see them again until they arrived in our cabin. 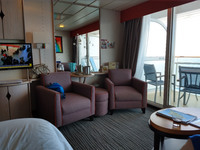 Our cabin was the same junior suite we had on the June 2017 cruise. Yes it was a bit more expensive than a balcony cabin, but it offered so much more room, along with an extended balcony with enough room for a sunbed, a full height table and 2 chairs. There was extensive storage space, so much so that we didn’t use all the shelves and drawers provided. For those who like a bath there was a shower and bath in the bathroom along with very nice Clarins toiletries. Nice fluffy bathrobes were provided along with slippers and along with the usual electric kettle and supply of tea, coffee, etc., the junior suite also had a Lavazza coffee pod machine producing excellent coffee. Well worth the extra expense in my view. Meals on the Discovery 2 were very good, particularly in respect of food on offer in the self-service Islands restaurant. We had just returned a month earlier from a 28 night cruise on P&O Arcadia where the food on offer in the self-service restaurant was absolutely deplorable, comprising one relatively tasteless soup at lunchtime and five or so unappetising main courses. Most importantly the food on Arcadia was seldom hot. The food on offer in Islands was a complete contrast with two delicious soups on offer each day along with eight-ten main courses including a roast of the day. All the food was piping hot. Food in the main 47⁰ restaurant on deck four and in the Italian fare restaurant Gallery 47⁰ on deck five was also very good. The clear tomato bisque we had one evening in 47⁰ was one of the best soups I have ever tasted. We had no need to use any of the paid restaurants on the ship as the food in the free restaurants was so good. Even the food in the outdoor Snack Shack on deck nine is to be commended, where the freshly prepared battered fish fillets and chicken wings are simply out of this world. In terms of entertainment Marella is not one of those companies that bring in loads of guest artists. They rely instead on a show team comprising singers and dancers that deliver no less than eleven quite distinct and different shows in the ship’s Broadway Show Lounge. The entertainment is reinforced with two very good bands – Muzik Nation and the 4Tunes – along with a very talented pianist (Dino) and other individual musicians. The place to be for up close and personal entertainment is undoubtedly the Live Room where each evening there is a full itinerary of music on offer from the various bands and artists, culminating in a ‘band jam’ once a week where all the musicians get together to perform. The lead singers from the show group also have guest appearances in the Live Room performing their own cabaret sets. Despite being relatively ‘senior’ cruisers we spent many an evening well after midnight singing and clapping along to the music there. The only slight criticism of the Live Room is that it is too small to be the hub of late evening entertainment particularly after the main shows disgorge from the Broadway Show Lounge. On many an evening it was standing room only. If I was to make one suggestion to Marella about this it would be to think about using the much larger Venue on deck 5 where possible. 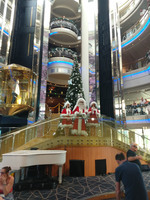 Marella Discovery 2 is of course an all inclusive ship and a very good all inclusive package it is too. I enjoy a Gin and Tonic or two before dinner and I was surprised to find that Tanqueray gin, normally only offered in premium packages, was being served by Marella in their standard package. What was even more surprising was the size of the spirit measures aboard the Discovery 2. Whereas on the P&O Arcadia spirit measures were a measly 25ml (5 x teaspoonfuls) on Discovery 2 measures of spirits served were 40ml. This compares to a standard pub measure of 30ml in most of the UK. Moreover, there was no difficulty obtaining a double measure, if like me you want to taste the spirit you are drinking. Unlike some ships we have been on there were always ample waiters around in show lounges and open decks to serve you. Some might be surprised to learn that Marella provides chilled drinking water dispensers on most floors and very good water it is too. A very nice 1 litre glass decanter is provided in your cabin so you can always have a supply of drinking water on hand and to fill your kettle or coffee machine. Dress code on the ship was generally relaxed or smart casual, but there were occasional ‘dress to impress’ evenings where some did make the effort to appear in their ‘finery’. On our recent Arcadia cruise a comedian made fun of Marella cruises, but based on my experience of both cruise lines I believe it is P&O that is becoming the laughing stock of the industry and Marella is firmly establishing itself in the middle ground of the cruising industry. A particular strength of Marella is its ability to offer cruise & stay/stay & cruise holidays where you can experience the best of what a cruise offers along with fabulous hotels in prime locations. I have no difficulty recommending the Marella Discovery 2 to any potential cruisers, be they first time cruisers or like myself experienced cruisers who want to try out the competition. To be absolutely clear Marella cruises does offer very serious competition. I will undoubtedly cruise on a Marella ship again and I am particularly looking forward to the 2020 season when the new Marella Explorer 2, previously the Celebrity Mercury, will be sailing from Newcastle. This will be a great attraction for those who like sailing from the UK and don’t have to worry about flying or taking an extra suitcase or two. 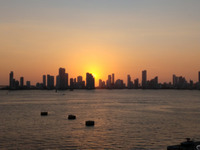 We had visited Cartagena previously and did trips there but for those just wanting to sample the atmosphere of Columbia there is a great free wildlife park at the entrance to the port where you will find a range of tropical birds, monkets and other wild life. Chose to go ashore at the port on this occasion as we have visited Puerto Limon previously and did an excursion. The town itself is a little run down but the people are very friendly and there is a nice park at the port where, if you are lucky, you will spot the odd sloth in the tree canopy or as I did a family of owls.